China Miéville’s “The City & The City” is one of the 2009 best novels and this fact is seen on the recognition and the awards it gathers. Another such novel seems to be Paolo Bacigalupi’s “The Windup Girl” which gathers appreciations as well, among them a Nebula Award for the 2009 Best Novel and a nomination for the Hugo Award. But these are not the only ones, because last week the Paolo Bacigalupi’s debut novel, “The Windup Girl”, was rewarded with The Compton Crook Award (thank you Cititor SF for the information). The Compton Crook Award is presented to the best first novel of the year in the Science Fiction, Fantasy and Horror genres by the members of the Baltimore Science Fiction Society. 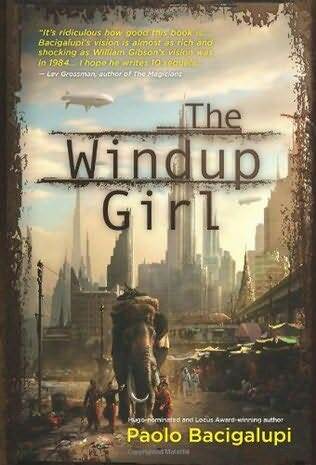 I have “The Windup Girl” on my shopping list for some time, but I always left it out of it when I ordered new books. I believe though that it is time for me to see how the Paolo Bacigalupi’s debut novel is and finally buy a copy of the book. Until then, I wish to congratulate the author for the Compton Crook Award! May indeed was an awesome month in terms of the books received and I could see that this week too when some new titles arrived into my mailbox. Also, May was a rich month when it comes to the books I bought because this month’s shopping list was the longest since the start of the year. Continuing the powerful epic that started with THE STORMCALLER; theLord Isak is dead, his armies and entire tribe in disarray. It falls to King Emin to continue the war alone, and the Menin are only too happy to meet his challenge. In Byora, Ruhen is developing his 'Saviour' persona. The Harlequins start preaching in his name and many of the pilgrims who flock to him are recruited to be 'Children', disciples who spread Ruhen's message. All over the Land people are starting to see Ruhen as the answer to their troubles. A showdown is coming: battle lines are finally drawn and the atrocities quickly mount. The spectre of the Great War looms, but in this age the Gods cannot and will not come to King Emin's aid. With the peoples of the Land turning against Emin and his few remaining allies, their only chance for survival lies in the hands of a dead man. Jean le Flambeur is a post-human criminal, mind burglar, confidence artist and trickster. His origins are shrouded in mystery, but his exploits are known throughout the Heterarchy - from breaking into the vast Zeusbrains of the Inner System to steal their thoughts, to stealing rare Earth antiques from the aristocrats of the Moving Cities of Mars. Except that Jean made one mistake. Now he is condemned to play endless variations of a game-theoretic riddle in the vast virtual jail of the Axelrod Archons - the Dilemma Prison - against countless copies of himself. Jean's routine of death, defection and cooperation is upset by the arrival of Mieli and her spidership, Perhonen. She offers him a chance to win back his freedom and the powers of his old self - in exchange for finishing the one heist he never quite managed . . . In the CHAGA novels McDonald brought an Africa in the grip of a bizarre ailien invasion to life, in RIVER OF GODS he painted a rich portrait of India in 2047, in BRASYL he looked at different Brazils, past present and future. Ian McDonald has found reknown at the cutting adge of a movement to take SF away from its Britsh and American white roots and out into the rich cultures of the world. THE DERVISH HOUSE continues that journey and centres on Istanbul in 2025. Turkey is part of Europe but sited on the edge, it is an Islamic country that looks to the West. THE DERVISH HOUSE is the story of the families that live in and around its titular house, it is at once a rich mosaic of Islamic life in the new century and telling novel of future possibilities. Villiren: a city of sin that is being torn apart from the inside. Hybrid creatures shamble through shadows and barely human gangs fight turf wars for control of the streets. Amidst this chaos, Commander Brynd Lathraea, commander of the Night Guard, must plan the defence of Viliren against a race that has broken through from some other realm and already slaughtered hundreds of thousands of the Empire’s people. When a Night Guard soldier goes missing, Brynd requests help from the recently arrived Inqusitor Jeryd. He discovers this is not the only disapearance the streets of Villiren. It seems that a serial killer of the most horrific kind is on the loose, taking hundreds of people from their own homes. A killer that cannot possibly be human. The entire population of Villiren must unite to face an impossible surge of violent and unnatural enemies or the city will fall. But how can anyone save a city that is already a ruin? - "The Sword of Albion" by Mark Chadbourn (through the courtesy of Transworld Books). Clive Barker’s “The Midnight Meat Train” is a spooky story and one among those published in the “Books of Blood” that made these collections one of my favorites. 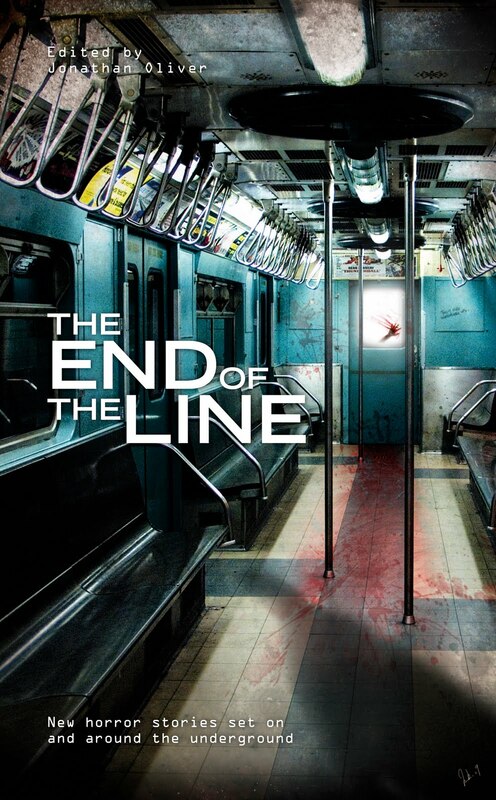 Two years ago “The Midnight Meat Train” turned into a movie and although the adaptation wasn’t as good as the Clive Barker’s short story, it still featured Vinnie Jones in a speechless and creepy role. But this is not the only exploration of the underground in the horror literature, because we have to admit that the underground stirs and tickles the imagination. Although there are still a few months until “The End of the Line” will be published I have plenty of reasons to put Jonathan Oliver’s anthology on my wish list so far ahead its release day. There is a title that gathers some hype for some time and I’ve seen it mentioned in many places. I admit that I am not very well informed about Justin Cronin’s “The Passage”, although I read a great review at Adam’s Wertzone blog and the synopsis I found on Orion Books’ website picked my interest immediately. However, for some strange reason the novel went under my radar. Fortunately not for long, because I found Justin Cronin’s “The Passage” again, together with an excellent book trailer, so this time I was sure to bookmark its release day. Amy Harper Bellafonte is six years old and her mother thinks she's the most important person in the whole world. Anthony Carter doesn't think he could ever be in a worse place than Death Row. FBI agent Brad Wolgast thinks something beyond imagination is coming. Deep in the jungles of eastern Colombia, Professor Jonas Lear has finally found what he's been searching for - and wishes to God he hadn't. In Memphis, Tennessee, a six-year-old girl called Amy is left at the convent of the Sisters of Mercy and wonders why her mother has abandoned her. In a maximum security jail in Nevada, a convicted murderer called Giles Babcock has the same strange nightmare, over and over again, while he waits for a lethal injection. In a remote community in the California mountains, a young man called Peter waits for his beloved brother to return home, so he can kill him. Bound together in ways they cannot comprehend, for each of them a door is about to open into a future they could not have imagined. And a journey is about to begin. An epic journey that will take them through a world transformed by man's darkest dreams, to the very heart of what it means to be human. Black Static is a magazine such as every dark fantasy and horror fan wishes to read, but also a magazine that other readers might find interesting as well. 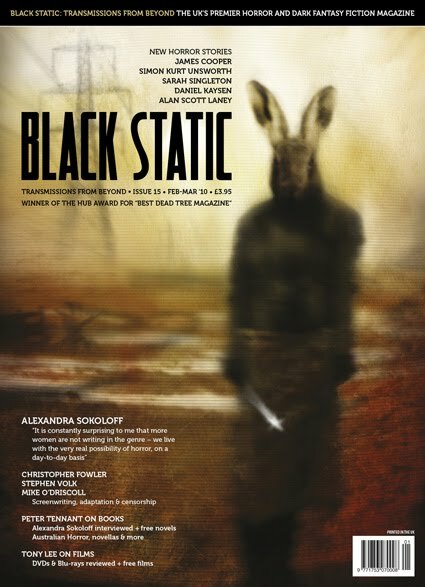 With its mix on non-fiction and fiction material Black Static offers information, reviews and stories that can open new doors to everyone indulging in the reading of an issue. The 15th issue offers the same alignment, with the non-fiction and article and the fiction pieces inlaid between each other, in a one-by-one pattern. The non-fiction is opened with the “White Noise”, a series of news compiled by Peter Tennant, followed by articles regarding the screenwriting and movie adaptations written by Christopher Fowler (“Interference”) and Stephen Volk (“Electric Darkness”), by a question raised over the limits of censorship raised in “Night’s Plutonian Shore” by Mike O’Driscoll and finished in style with the very informative reviews columns, “Blood Spectrum” by Tony Lee covering the DVD/Blu-ray releases and “Case Notes” by Peter Tennant covering the book reviews. “Case Notes” includes also a very interesting insight in the Australian horror and an interview with Alexandra Sokoloff. “Eight Small Men” by James Cooper – A man returns to the house where he and his brother spent a period with a foster family after the deaths of their parents. The return stirs heavyweight memories. James Cooper builds a powerful story, moving between two points in time that reveal disturbing and shocking images and events. It is an engaging story that creates an eerie atmosphere built on the childhood innocence and the events that might lead to the loss of that innocence. It is an evoking story that leaves an uncomfortable feeling. “The Knitted Child” by Simon Kurt Unsworth – A family deals with a miscarriage, each member in his own way. A short story, but a strong one nonetheless. Capturing different personalities facing a tragic event the story looks also into the bounds created within a family, focuses on the psychological aspect of the event and follows the swirl of emotions. A touch of supernatural will give the story an unsettling dimension as well. “Maximum Darkness” by Alan Scott Laney – A man finds himself in the middle of a story that seems reaped from a book that he once read. With all the honesty, this story didn’t work on any level for me. Completing a circle, with the beginning part similar with the ending one, the story seems only an excuse to complete that circle. I also couldn’t find a motivation behind the main character’s actions and I ended up wondering what the message of the story is. “Babylon’s Burning” by Daniel Kaysen – Invited by his brother to a company party the main character ends up recruited by this company, although he despise its actions and objectives. A story in which the character is trapped in a situation very similar with a pact with the devil. Although the main character benefits of many advantages the reverse of the coin offers unpleasant perspectives as well. There is an edge to this story too, since the character is forced into the acceptance of the situation rather than making that choice on his own accord. It is an interesting story, but it feels a bit disembodied and seems to be cut short. But maybe the author meant to leave the reader in a shadowy territory than in a clearly light or dark one. Also it seems to exaggerate with a singular type of reward, overusing it in my opinion. “Death by Water” by Sarah Singleton – Devastated by the loss of his wife and with difficulties in accepting this loss the main character seeks a contact with his departed wife through visits to different mediums. Another great piece of fiction, with a carefully and successfully built atmosphere, a strong character and haunting scenes, especially those invoking the memory of the lost love. Despite the fact that I was a bit disappointed by the end of the story, I really liked how Sarah Singleton worked on it, moving the plot on a steady rhythm towards its peak. Like I’ve said the fiction section consists, with one exception for me, in a well made selection, starting and ending with two very strong stories beating each other for the best presence in the issue. I really liked “Eight Small Men” and “Death by Water” and both of them satisfied me in the fullest, but I’ll give a small push to the first one because it revealed to me its author, James Cooper. I find myself in difficulty because I cannot find words to comment on the French cover artwork anymore. It is just stunning. After we have seen the book cover made by Didier Graffet for the French edition of the first novel in Kate Elliott’s “Crown of Stars” series, “King’s Dragon” (Le Dragon du Roi), it is time to see the one for the second novel in the series, “Prince of Dogs” (Le Prince des Chiens). 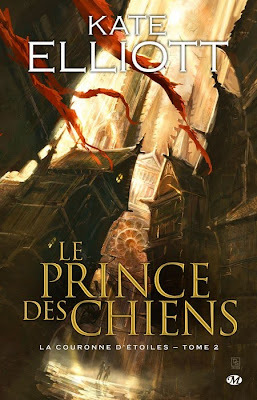 The French edition of Kate Elliott’s “Prince of Dogs” (Le Prince des Chiens) will be published by Milady, is due to be released on June 11th and like the first novel benefits from the artwork of Didier Graffet. And I have only two words for it: amazingly beautiful. The pickled Martian's tentacles are fraying at the ends and Professor Coffin's Most Meritorious Unnatural Attraction (the remains of the original alien autopsy, performed by Sir Frederick Treves at the London Hospital) is no longer drawing the crowds. It's 1895; nearly a decade since Mars invaded Earth, chronicled by H.G. Wells in THE WAR OF THE WORLDS. Wrecked Martian spaceships, back-engineered by Charles Babbage and Nikola Tesla, have carried the Queen's Own Electric Fusiliers to the red planet, and Mars is now part of the ever-expanding British Empire. The less-than-scrupulous sideshow proprietor likes Off-worlders' cash, so he needs a sensational new attraction. Word has reached him of the Japanese Devil Fish Girl; nothing quite like her has ever existed before. But Professor Coffin's quest to possess the ultimate showman's exhibit is about to cause considerable friction amongst the folk of other planets. Sufficient, in fact, to spark off Worlds War Two. Whether it's a curse or a blessing the fact remains: whenever Roger is in enough pain he can cross over to the Land of the Dead and speak to the people there. It's an unexpected gift - and one that, throughout Roger's life, his violent uncle has taken advantage of. Roger has been hauled from fairground to fairground, and beaten into unconsciousness, in order to bring word of the dead to the recently bereaved. It's a hard, painful way of life, deceiving the living for a crust of bread. So when Roger has the chance of a new life, it seems a gift. He has a chance at safety and at living a life of his choosing, tucked away in the royal court. But life is unexpected, and when Roger falls in love with the bewitching, willful Lady Cecilia he has no idea what he is letting himself in for. With every step he takes towards her, he is drawn deeper into court intrigue, into politics, and even into war . . .
. . . and when Roger's curious abilities come to the Queen's attention, everything changes forever. Trapped in courtly politics, bound by secrets, Roger is torn between his own safety and that of his friends. He can save them . . . but only if he can bring himself to perform a deed so unthinkable that the living and the dead shrink from it alike. . . The Land of the Dead is a dangerous place to be . . . and so is the Land of the Living. Conn is following a shooting star through a wilderness of woods and mountains, far from his home. What is he up to? Conn thinks the star will lead him to his locus magicalicus, or wizard stone. He needs this to save his city of Wellmet, whose magic is close to dying. With a new order of exile from Wellmet, this time with a death penalty, Conn has never been in such a tight fix. When a flame dragon shoots from the sky to pick him up in his mouth, Conn is swept away to a further adventure. Who is the dragon and will Conn ever get back to save his city, and himself, in time? Wizards have wondered for generations when a human would ascend to become the Ninth Avatar, and what would happen when they did. Opinions differ, but the Ninth Pillar of Magic—that of Darkness—is feared by many whether they use magic or not. When Starka, an outcast priestess of the magic loathing Cathedrals of Myst, receives a prophecy heralding this ascension, a new force rises to threaten the entire known world. The Carrion army, a race of transformed humans bearing black horns and an unquenchable thirst for blood, destroys every city it comes across. Their leader, Zion, has only one goal: to become the living embodiment of magic that is the Ninth Avatar. Aiding Starka in her quest to halt this are DaVille, a mysterious warrior bent on killing the Carrion leader; Cairos, a wizard from the betrayed city of Illiadora; and Wan Du and Lady Mayrah, a man and woman from rival nations now decimated by the Carrion. Amidst all this turmoil, Wadam, a Cardinal of Starka’s faith, seeks to seize control of Myst for himself and thereby subjugate the female leaders. With the world in peril Starka must find the means to prevent these things, or die trying. Rhone is an ex-soldier of mixed blood, more man than demon but with reserves of hellish power. He has led a peaceful life as a fisherman since his soldiering days and is raising his daughter, Enna. Returning home one day, he discovers Enna murdered ... or so he believes. And so begins Rhone's manipulation by Ducain, a demigod hell-bent on ruling the heavens. After avenging his daughter's death, Rhone grieves and isolates himself in the mountains. Ducain tells him his daughter's soul is locked in purgatory but can be retrieved ... and if Rhone also frees the titan who once defied the king of gods, Enna will live again. - "The Killing Moon" written by Rod Glenn, story by Rod Glenn & Jamie Mitchell (through the courtesy of Wild Wolf Publishing). A series of cataclysmic events bring about the global collapse of civilisation. The few remaining survivors must fight for their survival in a world plunged back into the dark ages. Twenty years on, a new generation grow up out of the ashes and, after their idyllic life is destroyed, five friends must leave their childhood home in rural Northumberland and embark on a perilous journey to Middlesbrough, a city gripped with gang violence and sectarian killings. Tragedy, lies and deceit mar their every step as they are cast into a dark and twisted world that is itself on the brink of destruction. The question of negative book reviews is raised in many situations and I believe that it will be raised in the future as well. Sharon Ring, the charming owner of the Dark Fiction Review, made a Q&A session at her blog about the aspects of negative reviews. Invited at the session are the both sides of the table, authors and reviewers. I am happy to be a part of the feature too, together with authors such as Gary McMahon, Mark Charan Newton, Bill Hussey and Joseph D’Lacey and fellow bloggers such as Amanda Rutter (Floor to Ceiling Books), Gavin Pugh (NextRead), Adele Harrison (Unbound) and Liz de Jager (My Favourite Books). Some very interesting answers can be found there. Deep in the research wing of the Natural History Museum is a prize specimen, something that comes along much less often than once in a lifetime: a perfect, and perfectly preserved, giant squid. But what does it mean when the creature suddenly and impossibly disappears? For curator Billy Harrow it's the start of a headlong pitch into a London of warring cults, surreal magic, apostates and assassins. It might just be that the creature he's been preserving is more than a biological rarity: there are those who are sure it's a god. A god that someone is hoping will end the world. The best novel I read so far this year was China Miéville’s multiple awards winner “The City & The City”, therefore the reasons for reading his latest published novel, “Kraken”, were very obvious for me. “Kraken” is madness. A whirlwind, urban, religious and humorous madness. China Miéville crafts a strange story that leads the reader within a secret London, one that is full of cults and magic and that works according to its own laws. Getting involved with the story doesn’t come easy, the start of the story is a bit difficult, the plot and the language are dense, the dialogues seem misplaced, everything requiring the full attention of the reader every step of the way. Once the story advances and I managed to settle my full attention on the reading however the novel became a strange but amazing journey. A journey that took me deep within a city that pulses (literally), with many cells that are missed by the majority of its common inhabitants, but palpable for those who know they are there. London is truly a living organism in “Kraken”. Billy Harrow, the main character of the novel, discovers this organism and many aspects that gravitate around it, hierarchy, religions, laws and culture. Through the eyes of Billy Harrow the reader will discover a sociology manifest hidden between the layers of the story. “The City & The City” was an approach on sociology made by China Miéville, but “Kraken” feels even more so. With a humor both light and dark aimed on places towards our modern society China Miéville deals with many elements that influence our living one way or another, TV shows, movies, music, books, Internet and the list can go on. In “Kraken”, London faces the apocalypse, but it is not for the first time. With numerous religious and cult groups, each one of them with its own vision and prediction of a catastrophic event, the city saw and sees such events with constancy worthy of a show. And this can very well be another parody of our modern society, because it certainly led me thinking of many apocalyptic scenarios we faced: eclipses, turns of millennium or ancient prophecies. Facing this latest apocalypse is an extensive list of characters. Lead by the curator Billy Harrow the list is colorful and spreads wide including Dane Parnell, an acolyte and bodyguard of the Church of God Kraken, Kath Collingwood, a policewoman with a supernatural ability, Wati, an ancient Egyptian spirit who is the head of a union of familiars, Goss and Suby, two very mean and dark assassins, and The Tattoo, one the main villains who is literally a tattoo. And this is just to name a few, because there are others as well with a more or less presence within the story. But as colorful as this cast of characters is not even one makes a boring presence, each one enriching the story. “Kraken” is an excellent example of how urban fantasy should be made and although the engagement with the story requires a bit of patience from the reader that doesn’t ruin the pleasure of reading this novel. I feel that the novel didn’t reveal all its mysteries to me in this first reading and that a second one will show me new dimensions of the story. 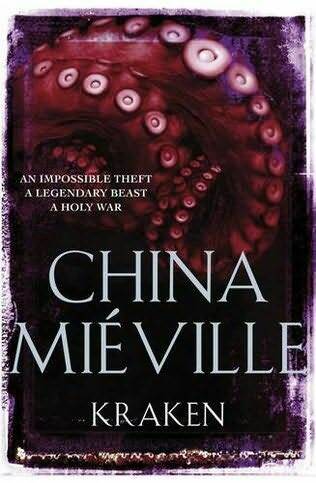 In the end, “Kraken” is a literary induced dream and China Miéville is the dealer providing it. The Romanian cover artwork has no soul, as much as I would like this aspect to be different. Rarely you can see a spectacular book cover, one that will make a casual buyer pick up the book from the bookshop shelves without any consideration for the title or the author of that particular book. But although this is the general line I am happy to see that little gems find their place among the countless stereotypical Romanian book covers. And for this I have to thank once again the small publishing house, Millennium Press, although its books don’t reach the bookshops in my town. I repeat myself, but the efforts of Millennium Press deserve every attention it can get, because on a struggling speculative fiction market it gives every fan moments of joy. Not only that Millennium Press publishes speculative fiction, but it stretches out a helping hand to the Romanian speculative fiction authors and also treats with more care the aspects of cover artwork. Its recently efforts count a SF Romanian magazine in physical format, something missed for some time here. 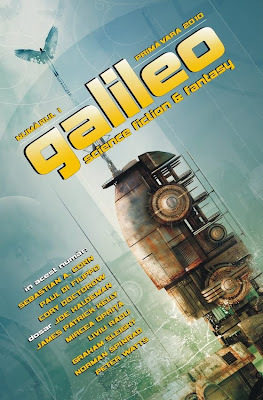 Galileo offers in 240 pages a chance to the Romanian speculative fiction to pick up speed. The cover of the first issue you can see here is made by the Polish artist Adam Tredowski. The mass market paperback of the Romanian edition of John Scalzi’s “Old Man’s War” benefits from a wonderful cover artwork made by the Romanian artist Mihai Titoiu. This cover proves that we have talent not only on the writing scene, but also on the art one. Sadly, many local publishing houses are indifferent to them. Last, but not least, my favorite. This summer Millennium Press will release a collection of stories by Michael Haulică, “Povestiri Fantastice” (Fantastic Stories). The volume gathers stories written in the last thirty years by Michael Haulică and its cover is made by the French artist Ludovic Cordelières. I absolutely love this cover, one that makes me think of fantastic worlds and situations. I would certainly pick this book even though the author would be a mystery to me. I really hope that other publishing houses in my country will find inspiration in the work made by Millennium Press, because this small press shows there is hope after all for a better quality in the Romanian cover artwork. The ebook editions of Robert Jordan’s “The Wheel of Times” series published by Tor Books reached the eight volume, “The Path of Daggers”, due to be released on May 18th. 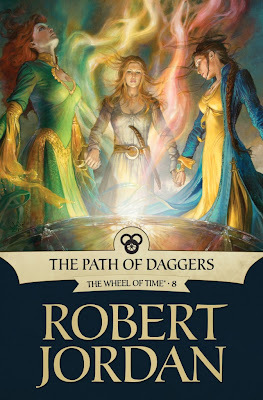 Tor Books set a high standard for the cover artwork of these editions and with the cover of “The Path of Daggers” they remain true to that standard. The artist who made the cover for this ebook edition is the well known Julie Bell. Julie Bell has done an excellent job with the cover, with a great attention to the details and with wonderful colors. As Irene Gallo, the Art Director of Tor Books, used us as well we can take a look behind the process creation with the help of an article on Tor.com. We can find there also a small, but interesting video in which Julie Bell talks about this cover, fantasy art and her works. As the awards official website states: In recognition of the legacy of Shirley Jackson’s writing, and with permission of the author’s estate, the Shirley Jackson Awards have been established for outstanding achievement in the literature of psychological suspense, horror, and the dark fantastic. "Witchfinder: Dawn of the Demontide"
Jake Harker is an outsider, a loser whose nose is always in a horror comic. That is until horror stops being fiction and the Pale Man and his demon Mr Pinch stop Jake on a dark, deserted road. That night, under a tree called the demon's dance, Jake will learn the true meaning of terror . . . Being impressed with the two horror novels published by William Hussey so far I was intrigued to find that although his next work was in the same specter as his first two novels, “Through a Glass, Darkly” and “The Absence”, he shifted his aim towards a younger audience. Nonetheless I was thrilled to pick up his latest novel, “Witchfinder: Dawn of the Demontide”, the first in a dark trilogy. Demons threaten humans throughout the entire literature history and they threat our world once more in “Witchfinder: Dawn of the Demontide”. But if the subject isn’t new the way William Hussey delivers his story makes from his novel a very pleasant and enjoyable reading. The story of “Witchfinder: Dawn of the Demontide” is also a race against time and this aspect is felt through the rhythm of the novel. From the first word put on paper William Hussey keeps the pace constant, shifting it only on some necessary points and only on a faster level. Therefore, the story moves quickly and on a natural course, without bumps that shake the logic of the plot, but with a few twists and turns that make the reader unaware of what the next page will bring. Like in my previous experiences with William Hussey’s works the first thing that engulfs me in his novel is how he describes things, characters and events. William Hussey is a natural talent in this matter, each image having an almost visual impact and the description helping the mind to build that image more easily. Also, a small piece of information can turn the elements with a less presence in the story almost as interesting as those that are covered more within the novel. 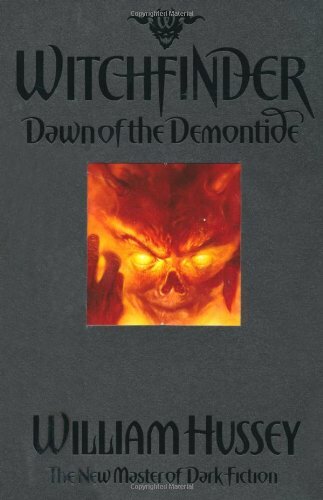 “Witchfinder: Dawn of the Demontide” comes with a few strong negative characters, a bit stronger than the positive ones in my opinion, wonderfully built by the author, from their physical appearance and until their hidden motivation. Adding to their presence are the demons bound to them, described by William Hussey in a way that can give a reader goose bumps. The novel is sprinkled with a few deaths and a quantity of gore that can’t be easily ignored. I personally don’t have a problem with these aspects, but I was left wondering that considering that the novel is aimed towards a young adult audience what will that audience think about these. I see the novel through adult eyes and since from my adolescence years the world changed a bit, I think that only an adolescent can say if the blood and death are used in excess or not. 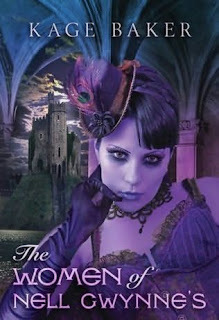 Due to the same fact, the novel being written for a young adult audience, I believe that William Hussey is bound within certain limits and therefore “Witchfinder: Dawn of the Demontide” felt a bit weaker compared to his first two novels. But maybe this comparison is not to be made. Despite the fact that “Witchfinder: Dawn of the Demontide” didn’t work as strongly as “Through a Glass, Darkly” and “The Absence” for me, the novel still offers a beautiful reading and proves that William Hussey is a talented author and one of the strongest voices of modern horror. Brian Ruckley’s “Godless World” series is one of the new fantasy series that I enjoyed a lot and find its place among my favorites. Also, Brian Ruckley picked my interest in his works not only with his debut series, but also with his short story, “Beyond the Reach of His Gods”, published by Rogue Blades Entertainment in the anthology “Rage of the Behemoth”. Looking for news about Brian Ruckley I discovered on his blog the artwork for the Czech edition published by Fantom Print of the second novel in the “Godless World” series, “Bloodheir”. I am not entirely sure who the character on the cover is, but I believe that the artwork matches the atmosphere of the novel and catches a glimpse of that harsh world. The artist of the cover is Kekai Kotaki, one of the best fantasy artists, who also made an excellent cover for the e-book edition of Robert Jordan’s “The Great Hunt” and who I had the pleasure to have among my guests of fantasy art posts. Older than her years and completely alone, Temple is just trying to live one day at a time in a post-apocalyptic world, where the undead roam endlessly, and the remnant of mankind who have survived, at times, seem to retain little humanity themselves. This is the world she was born into. Temple has known nothing else. Her journey takes her to far-flung places, to people struggling to maintain some semblance of civilization – and to those who have created a new world order for themselves. When she comes across the helpless Maury, she attempts to set one thing right, if she can just get him back to his family in Texas then maybe it will bring redemption for some of the terrible things she's done in her past. Because Temple has had to fight to survive, has done things that she's not proud of and, along the road, she’s made enemies. The destructiveness of passion, both earthly and supernatural, makes cities bleed and souls burn across worlds, through endless time. Experience the spiritual side of the zombie apocalypse in “The Days of Flaming Motorcycles” and transcend both hell and nirvana in “Zen and the Art of Gordon Dratch’s Damnation.” Look into “The Mad Eyes of the Heron King” to find the beautiful brutality written in the moment of epiphany or “Go and Tell it On the Mountain,” where Jesus Christ awaits your last plea to enter heaven—if there is a heaven to enter when all is said and done. Horror’s top authors and promising newcomers whisper tales that creep through the mists at night to rattle your soul. Step beyond salvation and damnation with thirty stories and poems that reveal the darkness beneath belief. Place your faith in that darkness; it’s always there, just beyond the light. In his electrifying debut, The Mirrored Heavens, David J. Williams created a dark futuristic world grounded in the military rivalries, terror tactics, and political wrangling of our own time. Now he takes his masterful blend of military SF, espionage thriller, and dystopian cyberpunk one step further—to the edge of annihilation . . . .
Life as U.S. counterintelligence agent Claire Haskell once knew it is in tatters—her mission betrayed, her lover dead, and her memories of the past suspect. Worse, the defeat of the mysterious insurgent group known as Autumn Rain was not as complete as many believed. It is quickly becoming clear that the group’s ultimate goal is not simply to destroy the tenuous global alliances of the 22nd century—but to rule all of humanity. And they’re starting with the violent destruction of the Net and the assassination of the U.S. president. Now it’s up to Claire, with her ability to jack her brain into the systems of the enemy, to win this impossible war. Battling ferociously across the Earth-Moon system, and navigating a complex world filled with both steadfast loyalists and ruthless traitors, Claire must be ready for the Rain’s next move. But the true enemy may already be one step ahead of her. - "Instinct" by Jeremy Robinson (through the courtesy of Thomas Dunne Books). A genetic disease known as Brugada Syndrome kills its victims without warning, without symptom. When the President of the United States falls victim to a weaponized and contagious strain of the disease, the Chess Team—King, Queen, Rook, Knight and Bishop—are assigned to protect Sara Fogg, a CDC detective, as she journeys to the source of the new strain: the Annamite Mountains in Vietnam. Surrounded by Vietnam War era landmines, harsh terrain and more than one military force not happy about the return of American boots to the Ho Chi Minh trail, the fight for survival becomes a grueling battle in the humid jungle. Pursued by VPLA Death Volunteers, Vietnam’s Special Forces unit, the team’s flight through a maze of archaic ruins reveals an ancient secret...a primal secret that may stop the disease from sweeping the globe—even as it threatens both the mission and their lives.